To meet the huge market demands, we are involved in providing Laser Alignment System. GTI@lign is a laser based shaft alignment system utilizing a groundbreaking single laser beam. The system was developed with ease of use and accuracy in mind. Enter dimensions, rotate shafts and display measurement result. possible user error for intelligent and precise alignment. Both horizontal and vertical coupling and foot results are automatically calculated and displayed. The graphics show the machine position and the arrows the necessary feet corrections. During Live Move, GTI@lign monitors the horizontal changes live on the screen, continuously updating the adjustments. 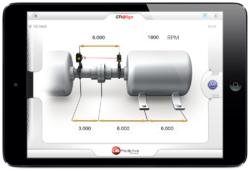 Measurement results can be immediately shared via email in a clear single-page graphical report to facilitate and shorten the alignment cycle time. The B.A.T. Laser Belt Alignment System is the latest innovation in laser belt alignment systems, utilizing our patented GlowLine green laser technology, and available in multiple configurations for every need. With our incredible TruView B.A.T. Targets, the offset and angularily of the entire sheave face can be easily seen, and precision adjustments made. And only the B.A.T. Laser Belt Alignment System offers our crossfiring B.A.T. Laser configuration, enabling users to check the offset and angularity between both sheaves at the same time! 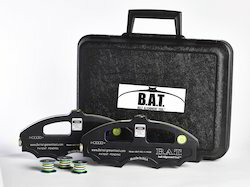 Includes 2 magnetic arc-shaped B.A.T Laser Transmitters, where each B.A.T Transmitter is also the B.A.T Target for its counterpart. The best option for faster, easier alignments! Each B.A.T Laser Transmitter can be used as a single belt alignment system. Also includes 3 GlowLine Magnetic Targets. Includes magnetic arc-shaped B.A.T. Laser Transmitter and magnetic arc-shaped B.A.T. Target for excellent accuracy across the entire sheave face. Also includes 3 GlowLine Magnetic Targets. Includes magnetic arc-shaped B.A.T. Transmitter and 3 GlowLine Magnetic Targets. Wireless Laser Alignment System offers the benefits of a dynamic precision laser shaft alignment on machinery with minimal waste of time and without stretching the budget. Proper alignment eliminates the leading cause of a machine breakdown and pays for itself! And furthermore, you can use such useful features as flatness/straightness/perpendicularity reconciliation, circle center finding and many other. All these combined with outstanding reliability make AVV-711 the best choice in laser alignment. AVV-701 – simple compact, reliable and affordable system for all rotating equipment. It offers the benefits of a dynamic precision laser shaft alignment on machinery with minimal with minimal waste of time and without stretching the budget. Proper alignment eliminates the leading cause of machine breakdown and pays for itself! Diminishes the cost of spare parts and production lost due to downtime! AVV-701 makes quick, accurate shaft alignment a simple task for all new alignment users! The system is designed of easy in use and user-friendly interface! Horizontal – For the alignment of horizontal machines train by any position of 9, 12, 3 or 6’o clock, or less 1200 rotation method. Soft Foot – To check that the machine is properly standing on all feet and remove “soft-foot” if occur. Thermal Growth – Input of cold coupling target for the thermal alignment compensation, considering difference in thermal growth between machines. Alignment Shim Simulator – Shims simulation function that allows to check the possibility of use of the present shims in case they differ from the results of the calculations. My Documents – Versatile PC compatible file system (FAT) allows to organize data file storage and report print. Falcon Eye – Quick and easy rough alignment procedure in the presence of a large initial misalignment, while turning machine shaft the laser beams travel outside the detectors. No need to adjust laser beam while talking measurement to ensure smooth measurement. 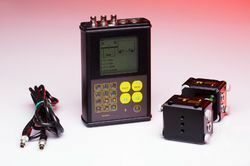 Electronic inclinometers allow for convenient measurement in any shaft position. 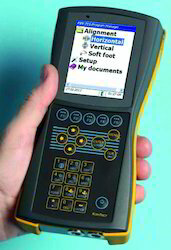 A rich set of options including horizontal and vertical machine alignment, direct PDF reports etc. Up to 1600 flatness points in single flatness work piece, i.e. no more complication in joining of data file. 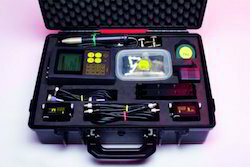 Looking for Laser Alignment Tool ?